You can also use charAt(index) method to get a char from String at a given index. Since String index starts from 0, "s".charAt(0) will return 's', which is even easier than earlier approach. Let's see examples of both of these approaches to convert String to char in Java. Btw, if you don't know System.out.println() method is overloaded and one version takes String while another take a character, here because we are concatenating String, the same method is called twice. See Complete Java Masterclass from Udemy to learn more about overloading and overriding in Java. Whatever we have done in the previous example, can also be done by using the charAt(int index) method. If you look closely, in the last example, we first get the character array and then retrieve the char from the first index because we knew that our String just got one character. Instead of doing all this you could have just called the charAt(int index) method. This code will return the character from the first index, which is 'b', hence we have successfully converted string "b" to character 'b' in Java. 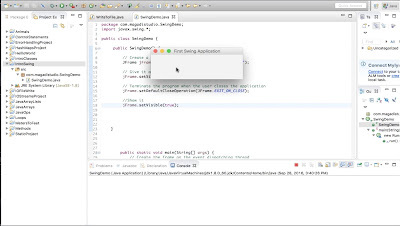 You can further see, Introduction to Java for Programmers to learn more about String and character literals in Java. 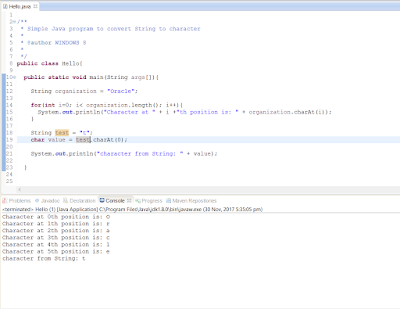 That's all about how to convert String to char in Java. This is one of the fundamental things which every Java developers should be aware of. You can solve many coding problems if you know these basic techniques because most of the String based coding problems are nothing but an array based problem, once you know how to convert a String to a character array. How to convert Map to List in Java? How to convert Double to Long in Java? How to convert Array to String in Java? Thanks for reading this article so far. If you like this tutorial and my explanation then please share with your friends and colleagues. If you have any question or feedback then please drop a comment.